The Worth Project started with encouragement from friends who wanted to talk about money but hadn’t found a place where they could have the right conversation. You know, that conversation where you can share your experiences and ask questions without judgment. Over the past few months, I’ve been getting emails from women who are kind enough to share their money story with me: the ups, the downs, and the in-betweens. I was so inspired hearing their stories that I knew I needed to not just keep them in my inbox. These were the money conversations that my friends were looking for. Welcome to “Money Talks” – conversations with real women who are doing really great things with their money, their mindset, and their life. My first conversation is with a woman who is a true inspiration. 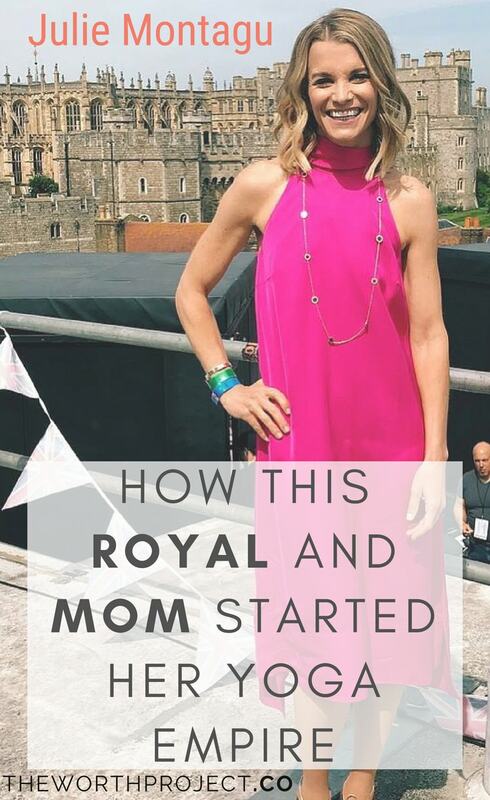 You may recognize her from her Bravo TV Show, Ladies of London, or from her recent coverage of the royal wedding of Harry and Meghan on Inside Edition, The Today Show, and BBC. She captured viewers with her fairytale story of being an American who moved to Britain and married into royalty (she’s also known as Viscountess Hinchingbrooke). But there’s more to her story. She’s an incredibly savvy and hard working business woman who created a yoga and self-care empire while balancing a family of four young children. Here we talk about the decisions she’s made – financial and other – that have helped her get to where she is today. Tell me a little bit about your background: what were you doing before starting your business? How did you choose that career path? I wasn’t doing anything close to yoga! I had started a post-production business and was working 6-7 days a week trying to grow it. I was really driven but also exhausted. After I had my fourth child I decided to take a year off to raise my family. How did you decide to leave that business? Did forgoing an income feel difficult? It was a very difficult decision to leave this business, but I knew that it was the right decision because I had four young children. Working so intensely wasn’t sustainable for our family and I needed to take the time to be home. It was an incredibly difficult decision to leave because the cost of raising a family can be overwhelming! So yes, forgoing my income was terrifying. But scary or not, at the end of the day I had two options: I could either continue my business and make money working my crazy schedule and never see my family or I could take a step back and spend time with my kids. The benefits of being with my family won. Your husband was sick for nearly 3 years and you had to step up to provide some support for the family financially (and emotionally). How did this difficult time lead you to your business? During the break from my career, I started to become interested in yoga and nutrition. Going from running a stressful business to raising four young kids, I needed to do something for me. I was tired, I spent my days taking care of everyone but myself. I didn’t feel great. Once I started doing yoga and looking at what I was eating, I started seeing massive improvements in my energy and my mental well being. I was hooked! As I became more interested in it, I did yoga teacher training and earned a certificate in plant-based nutrition from Cornell. When my husband became ill I decided that becoming a yoga teacher would be the right solution for my family. I still needed flexibility in my schedule to care for my kids and my husband, so going to a corporate job wasn’t going to work. My children were still very young but since my husband wasn’t able to work, I needed to do something to help support my family financially. My business didn’t become successful overnight – it was a lot of hard work! I’d push my youngest son in a stroller all over town putting up flyers advertising my yoga classes. I rented church halls very inexpensively to teach classes each week. And I took my resume to every studio around town trying to assist teach for popular instructors. I hustled to make an income, build my business, and support my family financially and emotionally. That hard work paid off and I’ve been able to grow that into a dream business. I now teach 80 person classes, I’ve authored four books, I headline festivals, and I work with amazing brand partners. But it all started with the decision to work hard every day and create the right solution to financially support my family. You’ve had so many opportunities in your career. One of the most public opportunities was as a member of The Ladies of London cast. You’ve said that being on the show was a good opportunity but you didn’t love being on a reality TV show because of how you had to portray yourself. How did you make trade-offs between earning and pursuing what you love? It’s was and still is a difficult balance! We have four kids. We have a historic property that is incredibly expensive to run and maintain. While I want to do things that I only really, truly love, like teaching yoga, there were points in this journey where I had to make the decision to do things that I didn’t necessarily love but would pay off in the future, like the TV show. As a family, we thought long and hard about whether the show would make sense for us. It’s a job and it would provide a consistent income that would help support us as I grew my business. People think being on a TV show is glamorous – it isn’t. The days were long and my schedule was hectic. But I was gaining exposure for my business and I was able to provide more financial support for my family, which we needed. The TV show wasn’t what I wanted to do long-term, so I had to stay focused on what my bigger goals were. We’ve talked about how you started very small with your business. How did you keep going and not get discouraged? My first classes in those rented church halls would have an average of 5 people. But there were times when I’d rent the hall and no one would show up. Rather than getting frustrated that I had spent money renting the hall and didn’t make anything, I’d take that hour to work on my business. I just didn’t let myself give up. Now the show is done and your business is booming. Has going through the experience changed how you think or feel about money? It has reinforced that finding the balance between money and family time was, and still is, the right decision for me. Though that’s no easy task! I wanted to pursue my passion for yoga and create a business that would allow me to make my own hours, my own money, and spend time with my family. It wasn’t lucrative at the beginning, but I was focused on knowing that this was the right decision for me. I was – and still am – extremely careful with how I spend my money. I don’t splurge. I save everything I can. And I spend on family holidays and activities, rather than material things. I’d rather spend money on great family memories. What is a money moment that you’re most proud of? I have two! Firstly, getting my first book deal with an advance from the publisher felt amazing. I had worked so hard creating my first blog on nutrition and to then have it published was a wonderful achievement with a wonderful advance. Secondly, as a yoga teacher, I get paid per student. The more students I have in my class, the more I get paid. When one of my morning classes sold out a few months ago with 75 students I actually cried tears of happiness. I still can’t believe that I have morning classes that can sell out. Want to join the conversation? Fill out this form to have your story featured.